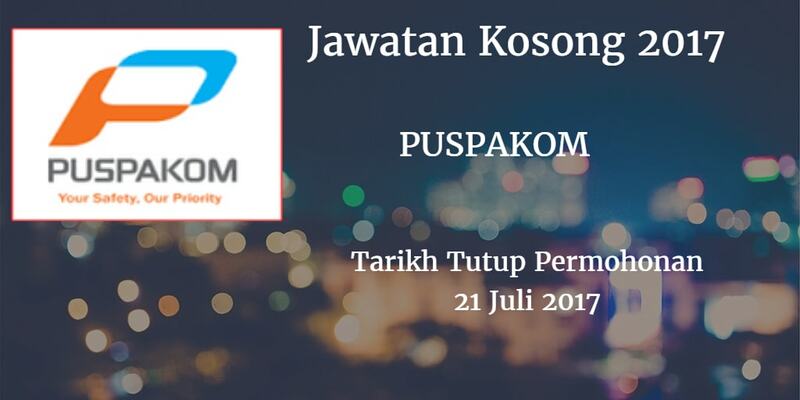 PUSPAKOM Warganegara Malaysia yang berminat bekerja di PUSPAKOM dan berkelayakan dipelawa untuk memohon sekarang juga. 1 . Perform vehicle inspection in compliance to the Act, Standard Procedures and Rules Regulations. 2. Ensure all equipment and tools for inspection purposes are in good conditions and well maintained. 3. Prepare inspection reports and ensure proper filing of documentation. 4. Attend customer queries and assign to the right personal. 5 . Perform any other duties as & when required by the Management. Mathematics or other technical subject in SPM. 3 . Must have valid driving license 82 & D.
5. Willing to be relocate at any branch nationwide. 6. Age must be below 25 years old and weight below 8okg. 7. Non-Bumiputera & fresh graduates are encouraged to apply. The selected candidates will undergo training for a maximum period of 3 months at QRB-HICOM UniverSIty incluswe on-Job-traimng at PUSPAKOM branches nationwIde. Your application should reach us not later than 21 JULY 2017.